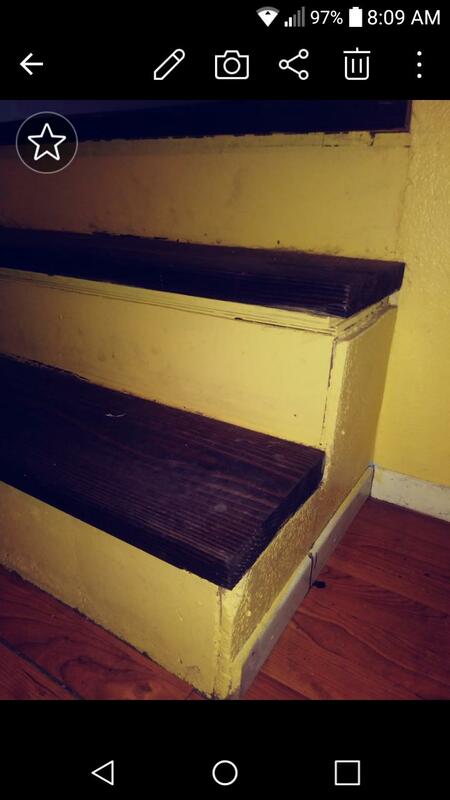 I love the treads on these stairs which I will be revitalizing. The risers are awful. I was thinking of adding a nose and then using 1/4 be needed plywood to cover the treads. The wall right next to the stairs had an orange peel texture and if I add plywood it will be higher than the wall. The steps change site tionand the rest of the flight has walls in either side and isn't an eyesore. Its just 4 steps that need help. Any suggestions would be super helpful! Thank you! There are a lot of ways to handle this based on your taste. The lower 2 treads appear to be cobbled together and if it were me I would tear them out completely taking care to salvage the treads. Then rebuild the lower structure from scratch utilizing the treads. Purely my opinion based on a single photo, but I think it would be easier than trying to clean up what is there and it gives you more options to do what you like. Then, whatever you do for the face of the riser, you can do above the second tread. Even if it sticks out beyond the face of the wall, it will look like a deliberate part of the stairs which will now be treated and seen as their own unit instead of a mishandled attempt to match the wall. At any rate, I wish you well with your project! How can I install these pre-hung doors? What technique is used to cut these door moulding? Do you need skirt boards on the stairs? How can I transition between these floors at differing levels?